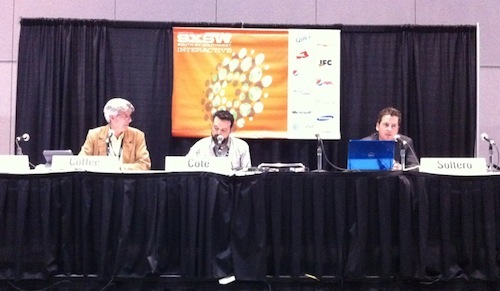 The SXSW 2011 panel on cloud computing I moderated (see here) is now available online. You can listen with the little Flash widget on this page, or download the MP3 directly if you prefer. The two panelest, Peter Coffee of Salesforce and Javier Soltero of VMware did an excellent job, and folks told me they enjoyed the discussion. While we spent a lot of time talking about “enterprise,” I tried to “translate” all that dry-cleaned goobly-gook into more consumer tech friendly discussions. Tell me what you think of it, it’s always nice to get input on cloud hoopla! Disclosure: Salesforce and VMware are clients.